This view from 1961 looks almost due east down Wall St. towards downtown Midland. The oil tank farms are barely visible at the top in the far distance. Centered at the bottom is the Bordens Dairy which is now home to a new building and the Permian Cardiology Associates. The old Midland Community Theater is just across the street to the south and adjacent to Dennis the Menace Park which is still in operation and has changed little since it was constructed in the late 50's. The Commercial Bank building, now Bank One, at the corner of Wall St. and the Andrews Hwy is just under construction. 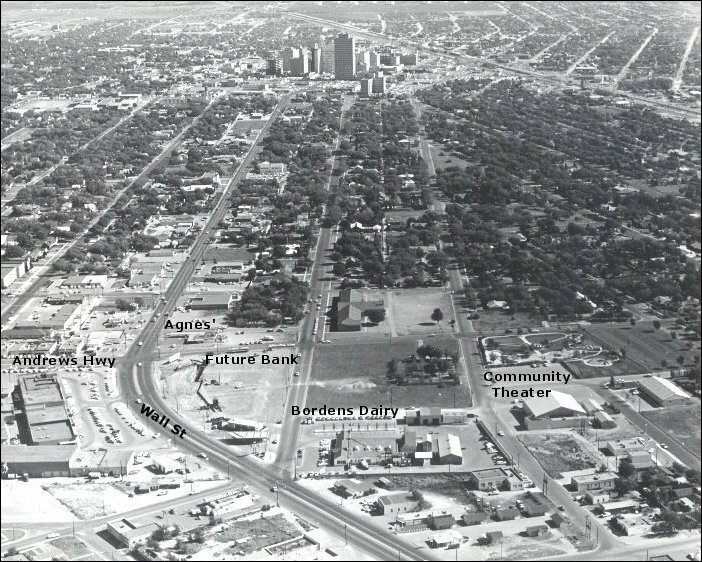 At the southeastern corner of this intersection is a Midland landmark now long gone....Agnes' Drive-In. A popular burger joint and hangout from the 50s and early 60s the little building was replaced by an indoor restaurant, Carrow's, and is now a locally owned family restaurant.